Let's Talk! : Vengeance Road by Erin Bowman - Next Page Please! Erin Bowman is one of my favorite authors, the amount of times I mention her or talk about her books on my blog here should give you that idea. When I first heard she was planning to write a western, I was excited but skeptical at the same time. Don't get me wrong, I knew it was going to be great but I think I was just scared to the fact that I might not enjoy it. I had read one western before Vengeance Road and fairly enjoyed it. However, if you compared my first western to VR, they had two different plots. I am glad I picked up VR though because it was one heck of a read with laughs, so much action, suspense, and a great read that one would read if they wanted to get into western novels. I think I enjoyed the plot the most for this book. Not only was it such a fun one, there was one end goal for the characters but the journey for towards that end goal was so uncertain for me, and as the book progresses I still didn't know exactly what would for sure happen because of how easily it was for Erin to twist the plot a bit. I knew the end game but the journey and process to that result was always a mystery to me and I loved how that kept me on my toes. The ending was really satisfying. Kate does what she sets out to do and I really love how the book just fades off in the end. Like this happened, time to return back to my normal life. I don't know if anything I'm saying makes any sense but the end just faded off and I feel like that is something I rarely see in books, especially books that have a ton of action in them. Another aspect I really loved about this book was the beautiful writing. Let me say, this book is definitely a western. The way the characters speak: western. The way Kate narrates: so western. Erin writes like she has a western accent and that really enhanced the western feeling and vibe to the book. 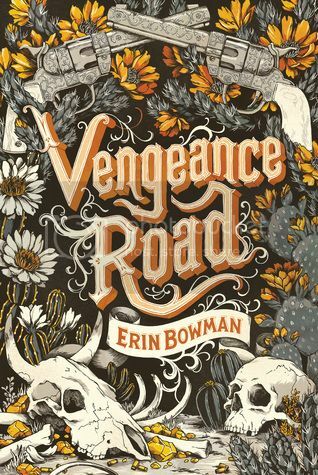 Loved it and it wouldn't be Vengeance Road without the western like narrating and writing. I gave this book 5 stars because I loved the characters, plot and thought the western like narrating and writing was a beautiful touch to the book. This was such a great book I'm in love. There has to be a few things before I end off this reviews. First off, Kate's mom being alive came as a complete surprise to me because not only was she alive but working with Rose? Interesting because you could really see how much gold can affect a person. Definitely a lot to Kate's past that was kept a secret also. Just a thought: Will's death was so sad. He may have not been on the best side with Kate but I hated to see him die ugh. I think the moment I knew Jesse and Kate were endgame when the two started being really bitter towards each other and being someone who has read enough books where the two character hate each other then start dating, I just knew Jessate was going to happen.